Soft And Comfy! Adorable Flower Headband! Ok Ladies, I am super duper excited to share this tutorial with you! This is my favorite little headband in the whole world. It is so soft and breathable and easy peasy to make, seriously! And it is totally adorable. I have to admit, I do love those dainty mini elastic headbands, but I always feel so bad when they cut into my baby’s soft little head. This headband is the solution, comfortable, wide band with no elastic! They go with everything and anything! Plus they can also be pulled over your little one’s ears to keep them from getting chilled. I love these for every day wearing, on my own baby! Knit Jersey Fabric – Fabric.com has a great selection of jersey knits, my personal favorites are the Laguna Stretch Cotton Jersey (tons of colors!) You want to choose a medium to heavy weight knit fabric made with mostly cotton. You are going to cut the headband perpendicular to the jersey lines in the fabric. Make sure you get a clean edge on both sides. I like to make my headbands 3-4 inches wide. They will roll on the edges so they won’t appear as big once they are being worn. If you are making a headband for a really tiny baby you may want to make the width closer to 2-2.5 inches. 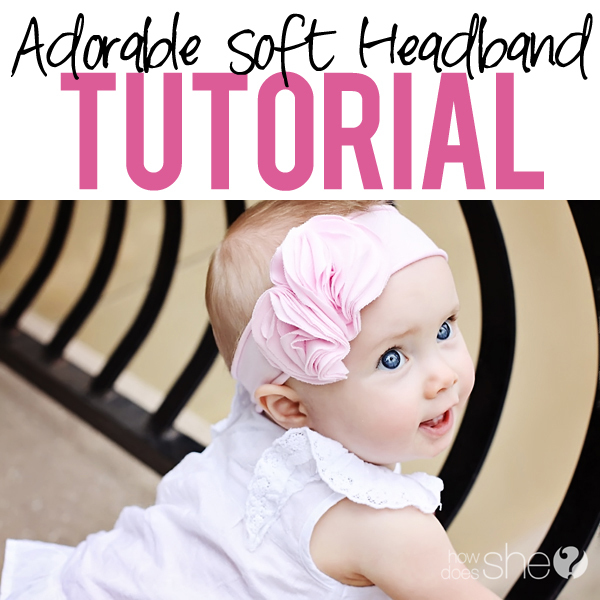 Cut the headband longer than you think you will need, that way you can get just the right size for your little one. Wrap the fabric around your child’s head. Hold the fabric where it overlaps and make sure it is really snug. The fabric will stretch when it is worn. Then hold the fabric or pin it where you want the seam to be. Do a simple zig-zag stitch on your sewing machine (with no back stitching). Try the headband back on your child and make sure it fits. If it is too big or too small simply unpick and try again. Once you have the headband the perfect size take a pair of fabric scissors and trim the excess fabric on each side of the zig-zag seam. Trim it fairly close, but not quite to the stitching. Go back over the seam with a slightly wider zig-zag stitch to catch the whole seam, this time you will back stitch. Roll the edges of the seam to an amount you think looks good. The more you roll on the seam, the more the rest of the headband will roll. I like to roll just a little bit. Hold the rolls in place and stitch over them with another zig-zag stitch. Back stitch over the rolls to make sure the seam is secured. Now, on to the flowers! If you are talented at cutting perfect circles… then lucky you! I need help in that department. I trace a cup onto a piece of paper then cut it out for a pattern. Fold the fabric over several times then hand cut, or use a pattern to cut out circles. You can make the flowers however big or small you like. I like my biggest circles to be about 2.5-3 inches across. You can also make one flower bigger than the other if you like! Be creative! For each flower you will want about 4 big circles, 4 medium circles, 2 small circles, and 1 baby circle. I cut the smaller circles out by hand.. can you tell? 😉 Each layer set should be about 1/8-1/4 smaller than the circle behind it. Once you have your flowers all laid out you will do a simple stitch to sew the layers together. You are going to make an X in the center. Starting in the back: stitch one direction, making sure to catch all the layers and leave a long tail. Then come back out on the bottom and stitch the opposite direction. Then clip the needle from the thread. You should have 2 long tails. Pull both of the tails very tight and tie a few knots to secure it. Then trim the tails down. Scrunch different sections of the flower on top to create that beautiful petal shape. Play around with the placement and pin the flowers on to see how it looks. Don’t try the headband on your baby while the pins are in.. We don’t want any injuries! Once you have a placement you like, hand stitch the flowers onto the headband. Use 4-5 stitches going through several layers of the flower to secure it. I like to place my flowers pretty close so they are kind of smooshed together. Once the flowers are on, trim all the threads… and you’re done! I love trying it on my baby for the first time! They are just so stinkin’ cute! They are super soft, lightweight and comfy for your little one! Head on over to fabric.com and order some knits right now! A stay-at-home mom who absolutely loves putting all her love, time and effort into raising her sweet kids (and husband) ;) . 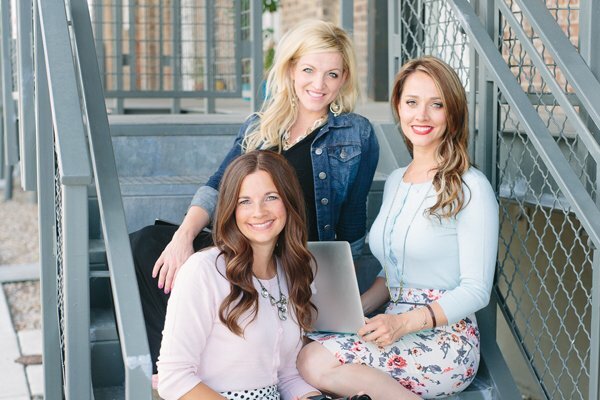 She is very interested in healthy living, hairstyling and using her creative side doing photography, graphic arts and making her house a home. « Turn your Easter Eggs into Musical Shaker Eggs. These look soo soft and cute, will be making these !!! Yay! My baby girl has little to no hair on her noggin and I hate when the other bands leave the indention on her head, so this is perfect, thank you! The light pink is all sold out! See what ‘cha did?! These are SO CUTE! Thanks for sharing… although I might do mine with hot glue since I have yet to learn my sewing machine. Such a cute idea, my sisters little one will need a bunch when she arrives. Thanks for the great tutorial! I’m going to have to try a few. My sister just had her first baby girl (3 Boys) so this little item will be perfect for her. Thanks for your great ideas!! This turned out so sweet! Love this! Now I just need a little girl! I don’t think any of my four boys would appreciate this! These are so adorable. I sat down to make some and I can not get my fabric to roll….at all. I’m assuming it’s the wrong fabric? Any other tips to help get it to roll? I had the same issue. The knit doesn’t roll. . .